On average, a four-cylinder vehicle travelling at a speed of 50 mph will produce 4,000 explosions per minute in its engine. These explosions create a massive amount of heat that could destroy the engine if not controlled properly--that’s where the cooling system comes in. A vehicle’s cooling system circulates a liquid coolant through the engine and then out to the radiator where it is cooled by air coming through the front grill. The main components of a cooling system include passages within the engine block and heads, a water pump to circulate coolant, a thermostat to monitor coolant temperature, and a radiator to cool the liquid after it has travelled through the engine. As the anti-freeze travels through these passages, it picks up heat from the engine and carries it away to the radiator where it is cooled. Once cooled, the liquid is sent back through the engine. It’s important to maintain coolant levels to prevent engine overheating and potential damage. At The Car Works!, we recommend that coolant be changed every 24,000 miles and that any cracked, leaking, or brittle hoses be replaced at the same time. There are specific requirements for mixing coolant, if you feel unsure about them bring your car to our service and repair center located in Warren, RI—we’re always happy to help! Engines generate an enormous amount of heat and must be cooled continuously to function properly. The vehicle’s cooling system controls engine heat by circulating a liquid coolant throughout the engine. Eventually, however, the coolant will become too hot and will have to cool off. When this occurs, the coolant is transferred to the radiator, which is located at the front of the vehicle near the grill. Once in the radiator, air coming in from the grill cools the fluid. Once fully cooled, the process will start over and the fluid will be re-circulated throughout the engine. Without the radiator, the coolant would continue to circulate and would eventually cause the engine to overheat. Overtime, leaks can form in different components of the radiator. At the first sign of leaks it’s important to have them fixed to prevent expensive damage to the engine. The Car Works! prides itself on providing the Warren, RI area with superior service at the best possible price. If you’re experiencing any issues with your radiator, come by The Car Works!, our expert technicians are happy to help! The cooling system’s thermostat is simply a valve measures and regulates the temperature of coolant. The purpose of coolant is too cool off the engine as it burns fuel. It does this by circulating through the engine, absorbing heat, and carrying it to the radiator. Once in the radiator, the coolant is cooled by the air stream from the vehicle’s grill and then re-circulated through the engine. The thermostat’s job is to determine when the coolant has absorbed enough heat from the engine and can be released into the radiator and vice versa. If it’s not hot enough, the thermostat will seal the radiator, forcing the coolant to circulate throughout the engine. If the coolant is too hot in the radiator, it won’t be released. If the thermostat is stuck open, the engine will run cooler than it should and use more fuel. Conversely, a thermostat that is stuck closed will cause the engine to overheat and could cause serious damage to the engine. Symptoms of a bad thermostat include a knocking sound when accelerating, low temperature gauge readings, overheating, decrease in fuel economy, and a malfunctioning heater. If you experience any of these issues, bring your car in a soon as possible. The Car Works!’s service and repair center is located in Warren, RI. As the engine burns fuel to generate mechanical force it creates an enormous amount of heat. If not dealt with, this heat would destroy the engine within a matter of minutes. To solve this problem, a liquid is used that can withstand temperatures above 250 degrees without boiling and temperatures below zero without freezing. 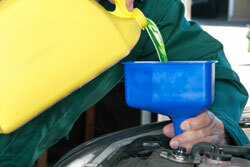 The liquid is generally a mixture of antifreeze and water that also contains additives to prevent rust and corrosion. This coolant is circulated through the engine where it picks up heat and carries it to the radiator. Once in the radiator, air coming in from the grill cools the liquid and it is re-circulated. Overtime, the coolant can become corrosive and, if not flushed, can cause problems in the cooling system. Corrosive coolant will eventually lead to overheating and coolant leaks. At The Car Works!, we recommend that your vehicle’s coolant be flushed on a regular basis to prevent unnecessary damage to the cooling system. Any leaking, brittle, spongy, or cracked hoses should be replaced before the antifreeze is replaced. The drive shaft is responsible for transferring torque between various mechanical components of the vehicle. Consequently, when something is wrong with your drive shaft or u-joints, the effects are felt throughout the car. Symptoms of a bad drive shaft include knocking or clicking noises, vibration, and resistance when turning. If you experience any of these issues, bring your car in right away. At The Car Works!, we recommend that you have your drive shaft and u-joints inspected regularly; it will improve your car’s overall performance and prevent you from having to pay for costly repairs in the future. So, whether you’re having trouble or just want an inspection, stop by our service center, located in the Warren, RI area. Our technicians are ready to get your car driving steady! The Car Works! is proud to provide the Warren, RI area with a wide range of services and repairs for your vehicle’s transfer case. In its most basic sense, a transfer case is a gear box found in four-wheel drive and all-wheel drive systems that sends power from the transmission to the front and rear axles. The gears within the transfer case need to be lubricated in order to stay cool and function smoothly. Overtime, however, this fluid becomes dirty or depleted and needs to be changed. Replacing this fluid will prevent damage to your transfer case and maximize its lifespan. Bring your car to The Car Works! and one of our expert technicians will inspect your transfer case for leaks, drain it of all fluid, and replace the fluid according to your vehicle’s specifications. The Car Works! service and repair center is conveniently located in Warren, RI. At The Car Works!, we believe that the best medicine for a bad CV (constant velocity) joint is preventative. By the time you hear clicking and clunking or feel any vibrations, you already have an expensive repair on your hands. The CV joint is the part of a vehicle’s drivetrain that transfers torque at a constant speed to the wheels and accommodates the up and down motion of the suspension. It is encased by a protective rubber boot called a CV gaiter and is attached to the driveshaft. The area between the boot and the CV joint is packed with grease to allow for frequent movement. Cracks or fissures in the boot will let this lubricating grease out and contaminants in, and can cause serious damage to the CV joint inside. If caught in the early stages, all it will need is some grease and a new boot. Once you start to hear noises, however, you might have to replace the entire shaft. At The Car Works!, we recommend that you have your CV joints inspected at every oil change. If you do start to hear any noises or feel your car vibrating, bring it in right away. Our service and repair center is located in Warren, RI.